DuPont™ Tyvek® 400D garments combine the protection, durability and comfort of DuPont™ Tyvek® fabric on the front and the comfort, softness and breathability of DuPont™ ProShield® 10 fabric on the back. 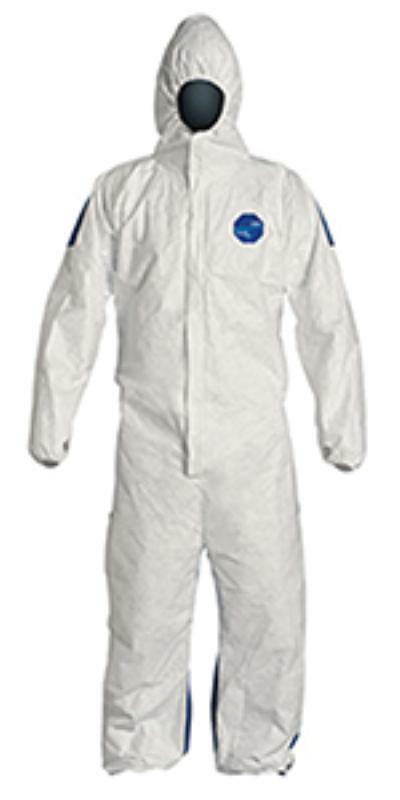 The DuPont™ Tyvek® 400D garments are suitable for applications where comfort requirements are combined with limited protective requirements for frontal exposures. Garments are available in a variety of coverall styles. Applications include fiberglass and composite manufacturing, wind turbines, boat construction and repair, remediation and maintenance. • Comfort fit design based on extensive wearer input to provide our most comfortable garment design that: enables a greater range of movement while stretching and bending, provides a more tailored fit, offers reinforcement in high stress areas for fewer blowouts, utilizes a longer zipper for easier donning and doffing and an elastic waist to better position the garment.